The caution comes from Dr James Hunt, a well-respected grains researcher from La Trobe University who was one of an impressive line-up of speakers at an agronomy forum hosted by Incitec Pivot Fertilisers in Melbourne in July. “In continuous cropping systems in high rainfall regions, we are mining our soil nitrogen reserves through our failure to match inputs with outputs,” James said. “The evidence suggests that many crops across all rainfall zones are nitrogen deficient, and this is one of the major reasons why cereal yields are on average only half what they should be. While acknowledging that nitrogen management in high rainfall regions is tricky, James said mid-row banding could be one way of increasing nitrogen availability. 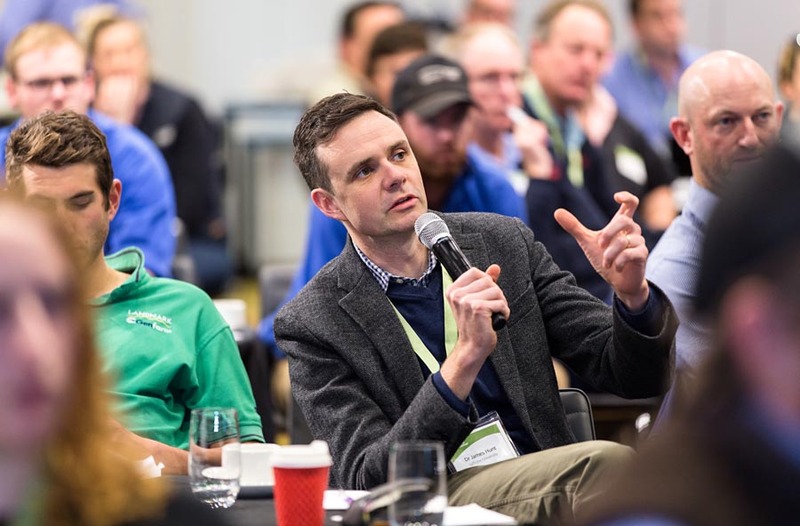 Now in their eighth year, the two Agronomy Community forums attracted more than 200 researchers and agronomists to Brisbane and Melbourne to gain the latest insights in plant nutrition affecting mainly broadacre cropping and pastures in northern and southern Australia. Charlie Walker, vice president agronomy and innovation with Incitec Pivot Fertilisers, said the forums were valuable for agronomists looking to improve the productivity of their farmer clients. “These forums are unusual because they focus exclusively on plant nutrition,” he said. Delegates enjoyed hearing from Dr Ross Brennan, Australia’s leading authority on trace elements who recently retired from the WA Department of Primary Industries after devoting most of his career to micronutrient research and development. Ross described some of his recent research on the residual value of copper and zinc applications in cropping and their reapplication in minimum tillage situations. “With copper for example, we get better responses by incorporating it with cultivation and using smaller granule sizes of less than 1 mm diameter,” he said. “The greater the number of cultivations mixing the copper through the soil, the better it is for plant availability. This is because smaller granules increase the number of particles in the soil, increasing the chance of root interception.” However, the extensive use of minimum tillage in modern cropping and growers preferring to use easy to handle granulated fertilisers meant these options were unlikely to be widely adopted. Ross said agronomists could still consider ways to increase the number of copper and zinc particles applied and improve the distribution of those particles throughout the entire soil. “One option is to band between the rows on a different inter-row line each year for several years, to improve spatial availability through the soil,” he said. “Another option might be to apply micronutrient fertilisers on diagonal rows.” He said some growers might consider a strategic cultivation of the top 10 cm of soil every five to seven years following an application of micronutrients. A lively discussion about the potential for bio-stimulants was led by Dr Robert Norton from Norton Agronomic, giving delegates the opportunity to share their knowledge and experience. In Brisbane, Dr Nikki Seymour, principal soil microbiologist with the Queensland Department of Agriculture and Fisheries, set the scene with an overview of the developing field of bio-stimulants. “Bio-stimulants go beyond microbial additions to include any substances or microorganisms applied to plants with the aim of enhancing nutritient efficiency, abiotic stress tolerance and/or crop quality traits, regardless of nutrient content,” Nikki said. In fact, some bio-stimulants are already routinely used, such as rhizobial inoculants. “There’s no reason why that success shouldn’t translate into other areas,” she said. “For example, there has been good progress in developing biocontrol agents to reduce cereal diseases. “A key factor for success in introducing organisms in farming systems is to ensure available energy or a host plant, a habitat and protection from predators so that there can be adequate populations of the organisms when they need to be working.” Nikki added there may be opportunities for products which improve the environment for beneficial bacteria, or systems which maintain soil health more generally, to support the communities of existing and positive microbial activity already present in the soil. Also in Brisbane, agronomists heard from Gavin Peck, senior pasture agronomist with the Queensland Department of Agriculture and Fisheries, who spoke about the rundown in phosphorus and nitrogen in brigalow soils and lack of legume based pastures. Gavin said this rundown had halved productivity in the brigalow belt, even though the region carries 30 per cent of northern Australia’s beef herd. Research by QDAF and the University of New England funded by Meat and Livestock Australia found that graziers and advisers need to challenge the paradigm that phosphorus is adequate for pastures in the brigalow belt. “These brigalow soils in southern and central Queensland were widely thought to have adequate phosphorus to support cropping, sown pastures and grazing animals, but our research shows conclusively that this is not the case for large areas,” Gavin said. “The reality in the brigalow country is that phosphorus levels are variable and these deficiencies are having an adverse effect on cattle production. Dr Rob Norton - Potassium: When will our system crash? Prof. Bernard Schroeder - Nitrogen: continuing perspectives in time and space! Dr Susan Orgill - You want to have your carbon cake and eat it too??? For nitrogens sake! Did you attend one of these events? Please leave us some feedback here.